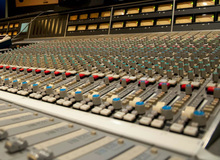 Rupert Neve Designs gives users of the 5088 mixing console the possibility to add motorized faders with the SwiftMix module. Ocean Audio introduced at Musikmesse 2014 the 900 Series version of The Ark mixing console. Unit Audio launched a new version of its Unit 16 x 2 compact summing boxes with panning option. Radial Engineering has introduced at NAMM 2014 the Space Heater 8-Channel Tube Drive and Summing Mixer. Harrison Consoles introduces a new analog mixing console in the 900 Series, the 950mx, a model that can host 24 modules. API unveiled today in New York its new The Box discrete mixing console, which naturally includes its 500 Format modules. Phoenix Audio is attending the 135th AES Convention where the introduce the Junior version of their Nicerizer summing mixer.